at London’s Garrick Theatre she is, anyway. 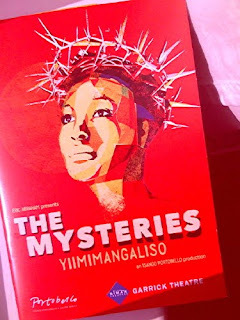 The Mysteries —Yiimimangaliso are the medieval Chester Mystery plays recast exuberantly in five languages into a carnivalistic but intense couple of hours by Isango Portobello, from South Africa. This was the theatrical experience of the year — a riot of colour, movement, and joy, with an intense burn — real flames, real joy, and some strange and original play on sound, enhanced by occasional random undergrond trains rumbling deep below the theatre. The Mysteries from Portobello Pictures on Vimeo. The company contains an impressive mixed array of old and young actors. The stories are all the more powerful for being allowed to stand up for themselves. Small touches of genius abound, from poor ol’ Noah’s problems getting Mrs Noah aboard the ark, to the risen Christ, disguised as a gardener, reinstating Peter in the garden by throwing him his shovel. Of course all there’s time for is to scratch the surface of the original cycle, but it’s brilliantly done. It’s joyous, uplifting and playful — even warmer and more engaging than the National Theatre Mysteries a few years ago, with God on a forklift truck. Sell your shirt for a ticket, before it’s too late. I can recommend this also - I saw it a couple of years ago and its just fab. Latin mixed with Middle English, Zulu and Africans - and occasioning a comment from my scandalised daughter when she saw Adam and Eve rather skimpily under dressed - I think its mean making them take their clothes off - (but that's what a diet of school does for you). 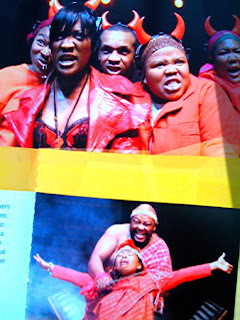 Can I also commend the film Son of Man made by the same theatre company - a township life of Christ which has remained largely undiscovered by the church in this country because it is so well.. African. Brilliant, provocative and quite different from the Mysteries.